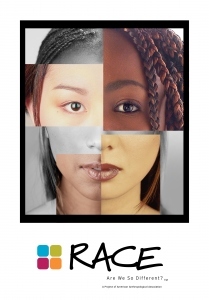 I recently went to the Smithsonian’s Race exhibit and accompanying lecture on “The Story We Tell”—a documentary film and talk on how the concept of “race” came about in the United States. Sponsored by the American Anthropological Association, this exhibit and three-part documentary series examines why race is a myth and how 19th century science legitimated and continued this myth. For the first settlers in the New World, class and religion were what were important identity-defining measures. However, when the United States was formed, a new measure of importance and equality emerged. The Declaration of Independence stated “all men are created equal”, yet many Americans owned slaves, including Thomas Jefferson, who wrote those words. Therefore, America needed a way to justify this apparent hypocrisy and instituted the concept of race and a hierarchy of advantage based on it. In the 1800s, scientists used skull size measurements as their proof that different races exist. However, these results were later found to be false. The myth of race was furthered by World’s Fairs, showcasing “savages” in their native environments. In 1899, in The Races of Europe by William Z. Ripley, Europeans were classified into three races: Teutonic, Alpine, and Mediterranean. The documentary and exhibit shows how the U.S. has used race as a justification for its Indian policy, particularly in regards to the Cherokee; war against Mexico; and annexation of the Philippines, and how the idea of race still exists today—decades after segregation. Other facts that have since been scientifically proven: race has no genetic basis, and most variation within people comes from within an ethnicity rather than between groups or “races”.